As you probably know, our inventory module has undergone many improvements, from its search abilities, to the removal of the requirement to have something in every box (you can leave them blank now). We recently also added the second and third database, so you can rig up a multi vehicle sale, and enhanced the addition and modification of repair orders. where you can group and sort using the mouse alone and recall a vehicle without using the keyboard. Some find it useful when you are not sure what kind of vehicle you are searching for and you are more comfortable with a report that you can select from. You can reorganize the columns in the grid by dragging to the first position which automatically sorts and groups the vehicles. CSV stands for Comma separated values, it’s the most common text based method for programs to talk to each other. If a file has the CSV termination and you have Excel in your system it will open up a spreadsheet which allows you to further perform calculations on the results from the report. 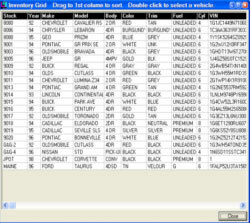 new variables include itemizations of equipment accessories , gap insurance etc. Another improvement for the MTD files is the ability to filter out transactions where a specific item does not match an item selected as is the case when you want to restrict the report to a particular city, make, client or salesperson. Finally the ability to memorize a report and to recall the last report that was run. These reports include additional information and calculations not available in the regular MTD’s. The answer is that by having a worksheet that does not cover up the whole screen you can have more than one, you could be working on one deal, and quickly pull up another to check figures for another customer, bank or partner. 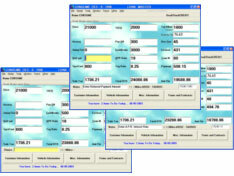 deal, while you calculate the requested changes while maintaining control over your bottom line. All prior quotes remain available on the screen so you can click back to them even if you have completely modified the current quote. Each quote is independent of the others and your bottom line is updated for each one. This one is rated “Best Closing tool in the Market”. E-mail support, write to support@ leasemaster.com with your questions. As you probably know we have enhanced the support service with the “Call me Back” button on the Contact Menu, and the web site, we continue to service your main program support via our same 800 701-6686 24/7 Our Forms department will also give you direct access numbers to reach your forms developer directly, If new forms are required we have a new price plan: Instead of ordering the forms one by one and paying for them individually you can order and pre-pay a five form package for 250 or a ten form package for 450, we will maintain an account of the forms due you and you can order them anytime. If you upgraded to Windows XP you may want to check out the new Setup video, it is different than in 98. © Copyright 2011 leasemaster.com All rights reserved.